January weather is usually cold and frosty, but this winter has been extremely mild and dry. However, the weather last Sunday for The Four Shires Bloodhounds meet here at Hoe Grange was extremely wild and windy! 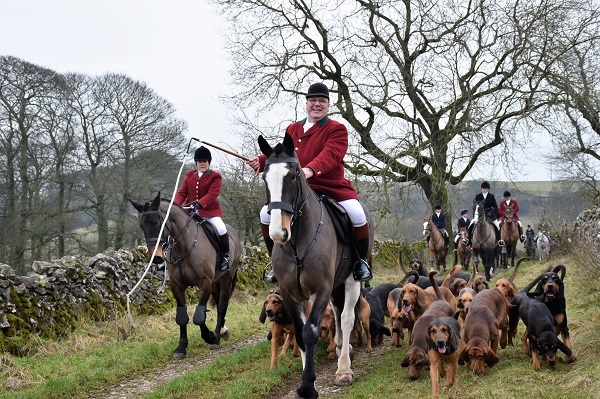 The Four Shires Bloodhound Hunt is so called as it covers the shires of Derbyshire, Nottinghamshire, Staffordshire and South Yorkshire. It attracts riders of all abilities and ages who enjoy cross country riding whilst tracking the scent of a human runner. Welcoming all, the hunt have a second field for novices and less confident riders who prefer to take the course gently or avoid the jumps. Did you know that Bloodhounds have a highly developed sense of smell, up to 800 times great than other dogs? That is why they make such superb hunting animals. Bloodhounds were originally bred for hunting deer and wild boar, and since the Middle Ages for tracking people. This breed is famed for its ability to distinguish human scent over great distances, even days later. However the forceful cross winds on Sunday meant the scent of the runners drifted and the hounds were working quite wide of the trail. 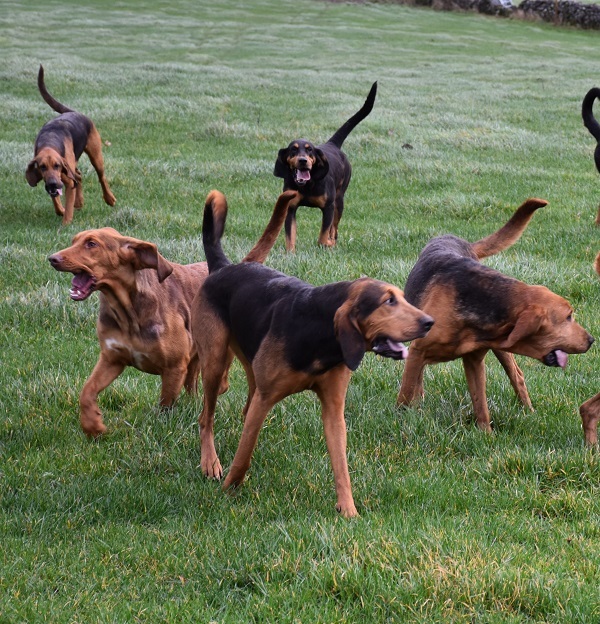 Things were a little chaotic at times as the hounds couldn’t hear the huntsmen calling them either! 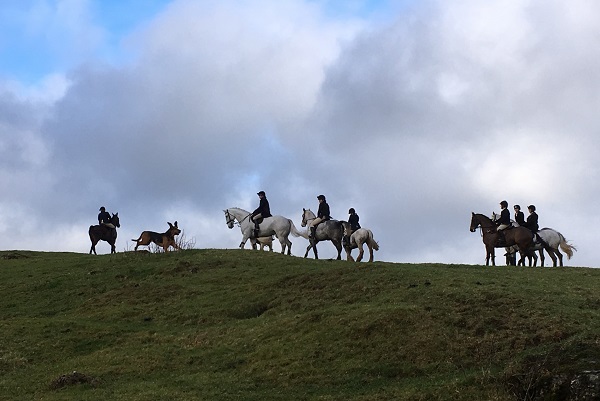 On the top fields of our farm it was quite difficult to stay upright on your feet – I don’t know how the riders stayed on their horses – horses tails, hounds ears, riders jackets and hat covers were flapping and flying about! Master Huntsman Chris Kane had trouble gathering the pack together on the tops but was ably assisted by his wife Deb and the other Whipper-Ins. The human runner or “quarry” was Paddy Wright who is a Derbyshire Cross Country Champion and fitness instructor. Being a runner over our hilly Peak District terrain is not for the faint hearted and you certainly need to be extremely fit to keep ahead of the hounds! This year Paddy was joined by Tom Ough, a journalist from the Daily Telegraph, who drew the short straw; his editors wanted an article on what it is really liked to be chased by a pack of hounds! Tom’s experience is to be featured in The Telegraph next Sunday – I wonder if he will mention losing his trainer – the mud in Derbyshire can be extremely sticky! Hunting with bloodhounds is often referred to as hunting the “clean boot”, although the runners shoes are definitely far from clean by the end of the day! Tom was nervous about being caught by the pack, but he needn’t have worried. Bloodhounds are large but very gentle-natured and despite their name the runner suffers nothing more than a few licks! The course averages 12 or 15 miles and is a pre-planned route so that the hunt can avoid worrying sheep and cattle or damaging crops. The runner can also adapt the route if he spots any unforeseen dangers. The route is split up into shorter sections called lines to allow the huntsmen to collect the hounds and the runner to get ahead. People often think that Bloodhounds started being used after the ban on fox hunting. This is certainly not the case. 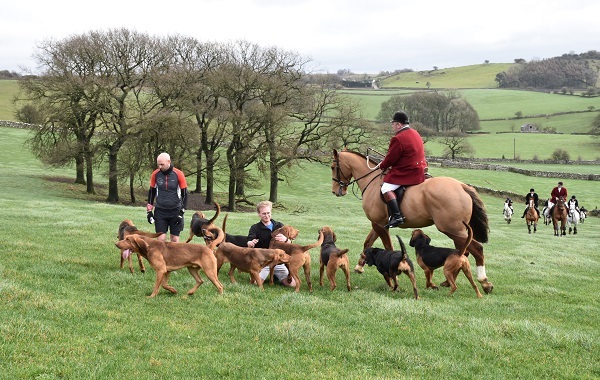 The Bloodhounds have been hunting across the Derbyshire countryside for many years. The famous Mitford sisters enjoyed hunting and it is only fitting that Duchess of Devonshire is the current President of the Four Shires Bloodhounds. I didn’t ride Oliver this year as he gets over excited with so many horses and the baying hounds – hounds, horses and humans all love a good day out in the countryside as you can see from the photos on our Facebook page. The video below explains more about the Four Shires Bloodhounds and how Ellie from Countryfile also found being the human quarry a tough job!